PRISTINA, Kosovo (AP) — Tension flared in a familiar section of the Balkans as thousands of people marched Saturday in Kosovo’s capital against a possible territory swap with former war foe Serbia, while the Serbian government put its troops on alert after special police were deployed to Kosovo’s Serb-dominated north. Serbia reacted after Kosovo’s special police moved into an area around the Kosovo side of the strategic Gazivode Lake, Marko Djuric, director of Serbia’s Office for Kosovo and Metohija, said. Kosovar President Hashim Thaci visited the area near Serbia’s border Saturday, a move that temporarily redirected attention away from the large opposition protest in Pristina. A security unit was dispatched to the area for the president’s stop, Kosovo police said. Serbia’s Djuric said special troops must not be deployed unannounced to northern Kosovo, where the country’s ethnic Serbian minority population is concentrated. Serbian media said Belgrade has complained to NATO Secretary General Jens Stoltenberg. President Aleksandar Vucic, an ally of Russia in the Balkans, warned at a press conference later on Saturday that Serbia will not allow any violence against the Serb minority in Kosovo. Asked if he would seek Russia’s help as Syrian President Bashar Assad, Vucic responded he would seek advice but not military help from President Vladimir Putin during an upcoming visit to Moscow. “I would not like to see great global conflicts take part on our territory,” said Vucic. Serbia does not recognize Kosovo’s 2008 declaration of independence, but their governments have been in European Union-mediated negotiations for seven years. The two sides have been told they must normalize relations as a precondition to EU membership. Thaci has said a “border correction” could be part of the discussions. Some Serbian officials have suggested an exchange of territories could help end the dispute. One idea that has been floated by politicians in both countries involves exchanging predominantly ethnic Albanian Presevo Valley in southern Serbia with Kosovo’s Serb-populated north. However, the idea has faced opposition from Germany and other EU nations, which have said they fear a Kosovo-Serbia trade could trigger demands for territory revisions in other parts of the volatile Balkans. Thousands of supporters of Kosovo’s opposition Self-Determination Party marched peacefully through the capital of Pristina on Saturday to protest any potential change of borders. 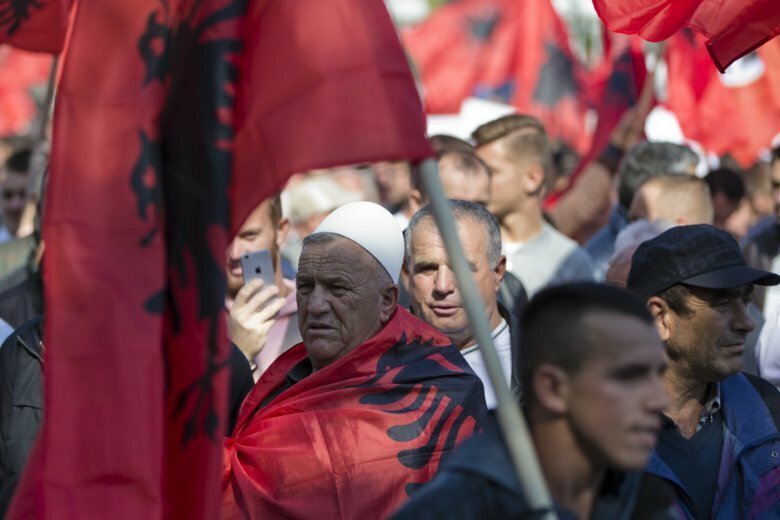 The protesters held national Albanian flags. Opposition leader Albin Kurti said he considered Thaci a collaborator with Serbia and called for fresh elections. “Such a grandiose protest is our response to the deals from Thaci and Vucic,” Kurti said. Thaci has rejected both border revisions based on ethnicity and a possible land trade. Three weeks ago, Serbian leader Vucic visited the lake in northern Kosovo that Thaci traveled to Saturday. Thaci’s office issued a statement acknowledging his visit to a border crossing and the lake. “During the weekends the head of state usually goes to Kosovo’s beauties,” the statement said. The governments in both Pristina and Belgrade have said they hope the EU-mediated talks will result in a legally binding agreement. “Talks (with Serbia) that continue will be on peace and stability,” Thaci said Saturday. This story has been corrected to show that Serbia’s president was in northern Kosovo three weeks ago, not two.